My kids are always eating carrots and celery so I keep all of the ends of them in a ziplock bag in the fridge. 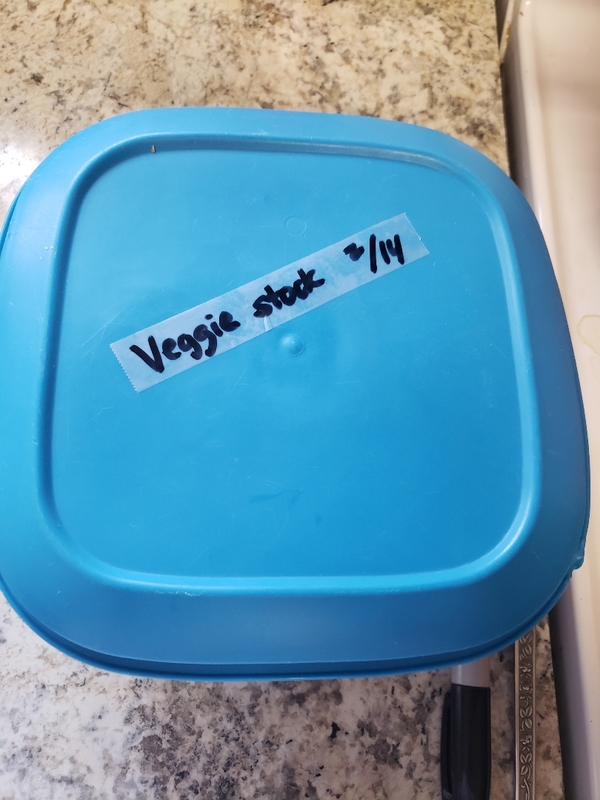 If you have any recipes that require vegetable/chicken/beef/fish stock, use that extra celery and carrots to make a stock that can be stored in the freezer until needed. Today, I will be making a vegetable stock. I’ll chop up some onion and gather the seasonings that I plan on using to make a sachet (you can be creative: I used clove, parsley stems, black pepper, and bay leaves). The appropriate term is sachet d’epices which is French for “spice bag”, often called “sachet” for short. (If you don’t want to make a sachet, you can still cook the sachet items in the pot, just strain it carefully after…). Once the sachet is made, I’ll tie the string on the lid of the pot, add the vegetables and pour enough water to cover them. I’ll place the sachet in the pot and cover with the lid, then let it simmer for at least 3 to 4hrs on medium heat. After 4hrs of cooking, turn off the heat and let the stock completely cool off for storing. Your needs will determine how you decide to store the stock. Whether you pour it in several containers or 1 big container with a proper cover/lid, remember to label it. If you put it in the fridge, it’s good for up to 3 days but if you decide to freeze the stock it will keep for months. I’ll be making some broccoli cheese soup with this!